2018 marks 100 years since the end of World War I. “The Great War” raged for four merciless years, from 1914 to 1918, and left a trail of destruction in its wake. Cities were ruined, lands were ravaged, and millions of soldiers and civilians were killed before peace was eventually declared. Join us as we reflect on some rare color photographs taken at the heart of the conflict. For most of us, the idea of a world war is terrifying and alien. For children growing up in the midst of WWI and WWII, it was simply life. Some of the most striking images taken during these times involve children. In this candid snapshot, a little blonde girl in a gingham dress is pictured in 1917 by photographer Fernand Cuville. 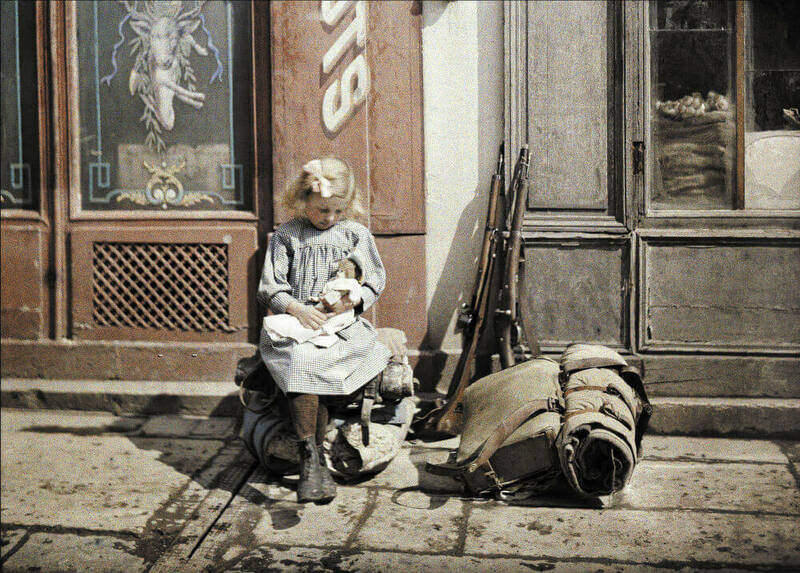 She innocently plays with her doll, while the backpack and guns of a soldier sit next to her, a stark contrast to the otherwise common scene. This was taken on the Western Front in Reims, Marne, France. WWI was brutal and vast. It destroyed large parts of France as the battle raged on between the Allied follow-up offensive against the right wing of the German First Army. The Aisne, a river that winds westward between Compiegne and Berry-au-Bac, would be the site for three battles over the course of the war. 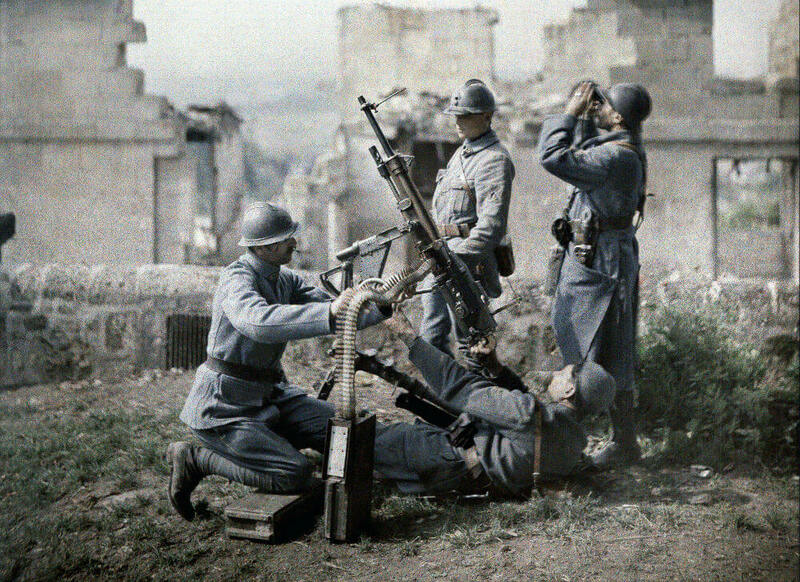 French soldiers are pictured here as machine gunners take a position in the war-stricken ruins during the battle. Two soldiers man the gun, carefully loading bullets into it as two other soldiers check the surrounding areas. While the soldiers were on the front line laying down their lives for their country, medical professionals were left to deal with the aftermath. From doctors and nurses to ambulance staff and clergy, all experienced the kind of trauma that they could never be prepared for. 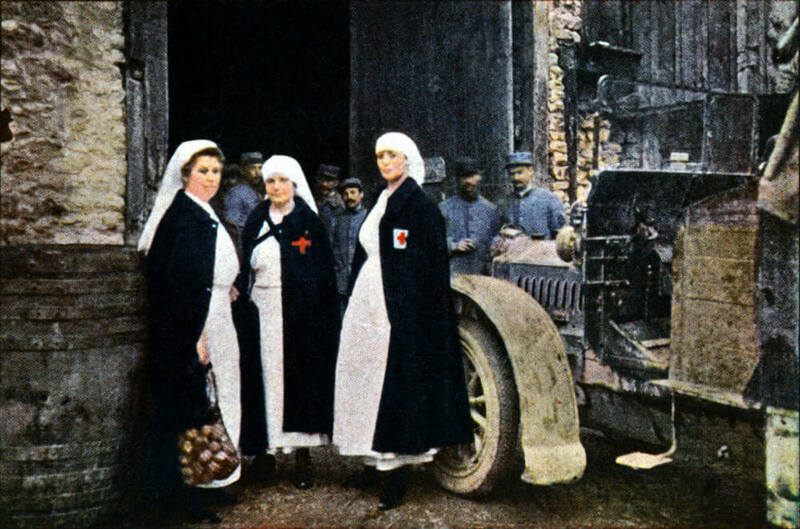 Three women wearing Red Cross nursing uniforms stand alongside ambulance staff and a vehicle in September of 1916, during the Battle of Verdun on the Western Front. All gaze into the camera, not realizing that their image would forever encapsulate of one of the bloodiest wars in history. In war, times to take stolen moments alone are few and far between. 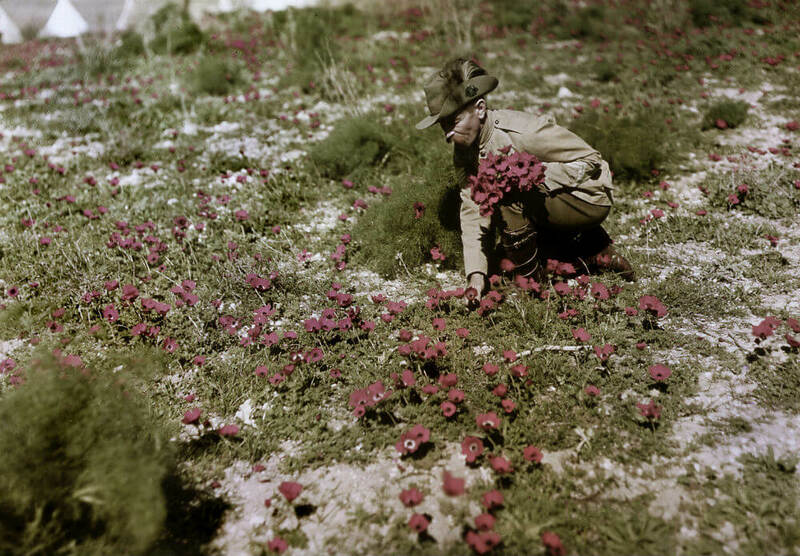 In this touching picture, Australian soldier George “Pop” Redding from the 8th Light Horse Regiment takes a moment to gather some flowers during the war against the Ottoman Empire. Taken in 1918 in Palestine by James Francis Hurley, the photograph provides a unique view of nature’s beauty against the harsh backdrop of a war that raged for four long, bloody years. Casualties in this part of the war, the Middle Eastern Theatre, would rack up into the millions. Before the war, parts of France were full of gorgeous architecture, lively, bustling squares, and a provincial way of life that residents called home. When the battles started, prized buildings were destroyed and beloved homes abandoned. 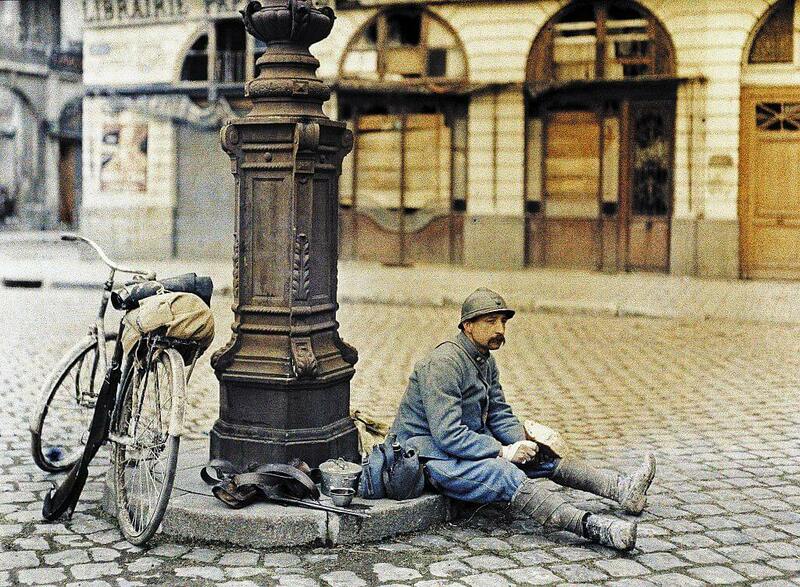 Here an unidentified French soldier takes a moment to sit and reflect on the scene in a town square in Reims in 1917. Behind him is the damaged library, while his bicycle sits propped up. His equipment sits neatly arranged around him as he forlornly surveys the scene, undoubtedly exhausted. Photographer Paul Castelnau took the candid shot. He passed away in 1944, a year before WWII ended. Alongside Serbia, Russia, France, Italy, Belgium, and the United States, the United Kingdom was part of the Allied Powers in WWI. The opposition, The Central Powers, was comprised of Austria-Hungry, Germany, Bulgaria and the Ottoman Empire. 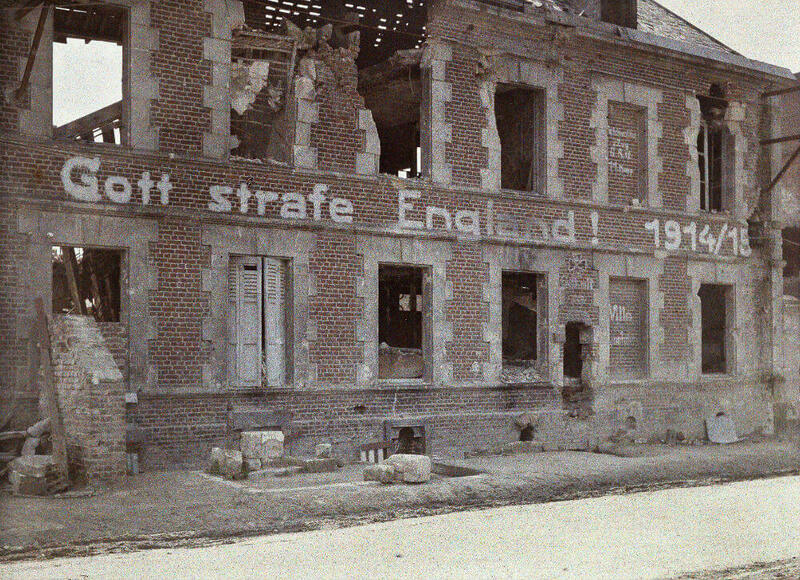 Tensions between Germany and England were particularly poignant, as is demonstrated here by the German army slogan painted in giant letters on the side of a damaged building in Aisne, France. “Gott Strafe England!” translates to “May God Punish England.” The photograph was taken by Fernand Cuville in 1917. The two countries would later come head-to-head once more in WWII. For soldiers, a lot of war is waiting. Waiting to be told what to do, waiting to go into action, waiting for the opposition to make a move. It’s a long, often soul-destroying game that can only end in tragedy. For those on the front line, the difference between one movement can mean life or death. Here, soldiers of the 2nd Australian Light Horse Regiment hunker down behind the front line barricade at Nalin on January 17, 1918. With their weapons poised and ready for action, one man hands a grenade to his fellow comrade. As you can see, the terrain was dry and unforgiving. 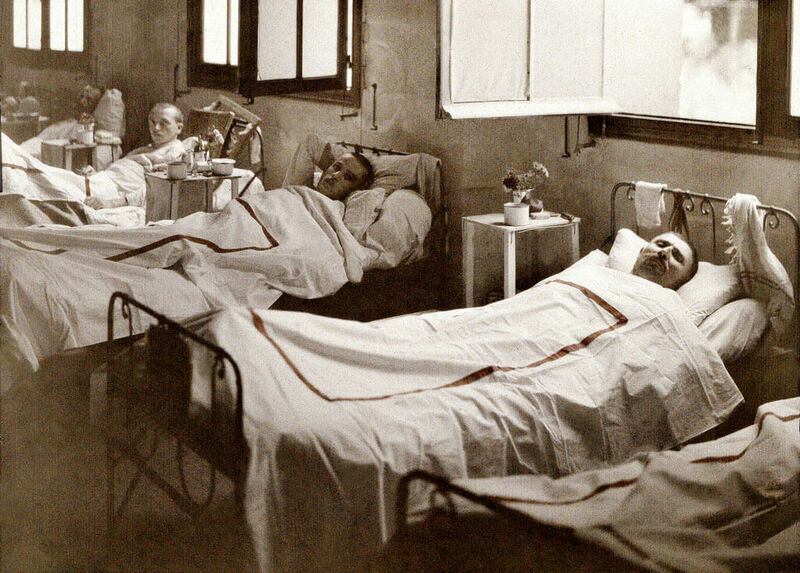 Conditions were so bad in hospitals at the height of the war that doctors and nurses were pushed to their limits. Not only was there the worry of an imminent bombing, but such vast quantities of casualties came through that some would simply die before they could be treated. 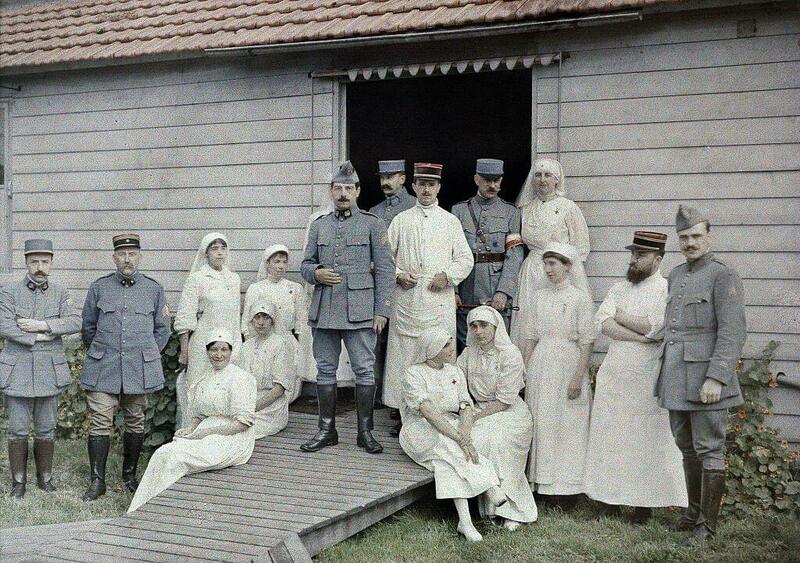 Here French military doctors and nurses stand in front of the Saint-Paul Hospital in Soissons, France, in 1917. This would’ve been a moment of solitude in a time that was turbulent and tense. After the war, much medical staff would leave the profession, unable to forget what they had seen. Along with firearms and bombs, mines were one of the deadliest weapons used in WWI. Soldiers would plant bombs underneath vital positions unbeknown to the opposition, catching them unaware. The above picture is of a mine crater, 116 meters wide and meters deep. 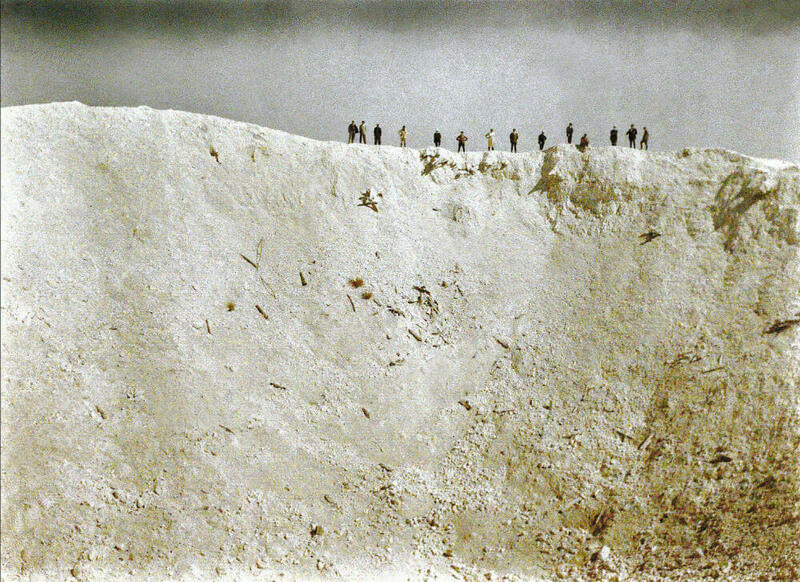 The British placed 19 mines underneath German positions near Messines on June 7th, 1917. When they exploded, around 10,000 soldiers perished. According to experts, the blast was so huge that it could be heard in Dublin and London. The death toll was so high it was considered a great victory. Almost the entirety of the 3rd Royal Bavarian Division perished. When we think of soldiers riding into war, most of us think of them charging in on armored tanks or even on horseback. 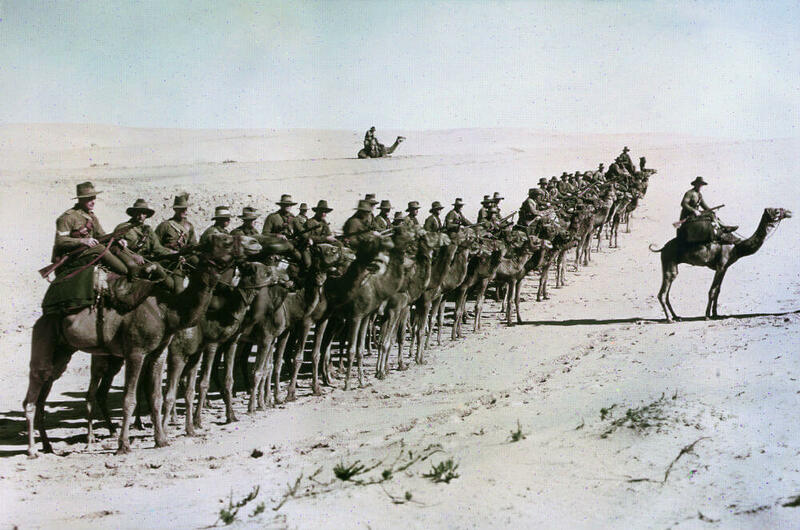 However, for the Australians fighting in the Ottoman Empire, camels were the most obvious choice. The soldiers of the Imperial Camel Corps are pictured here by photographer James Francis Hurly on January 26, 1918. Situated near Rafa in the Middle East, the comrades wait for their orders as they stand assembled in a line, while their superior leads the way in front. Out in the distance, you can see a singular rider on a seated camel in the desert. 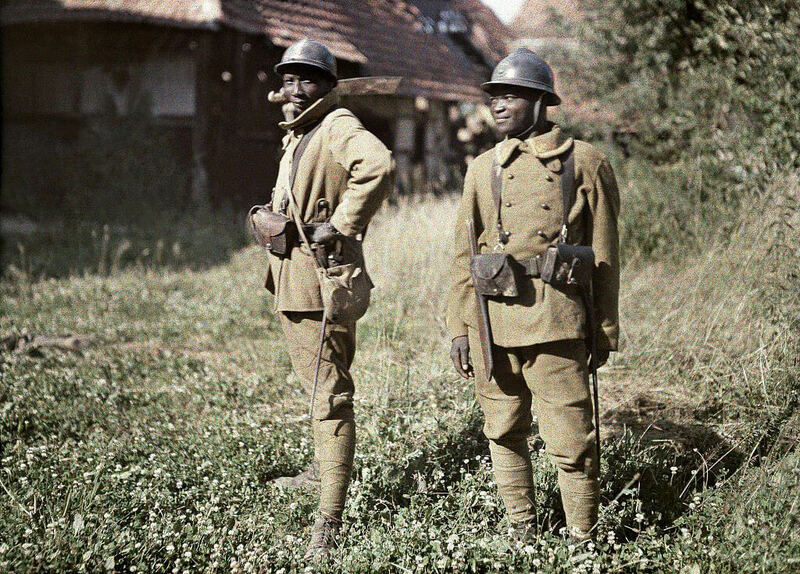 There were exactly 21 battalions of Tirailleurs Senegalais in the French Army during WWI. Most served in West Africa or in Morocco. When war broke out, they were transferred from Morocco to France, with five battalions serving on the Western Front. These four soldiers served in the French Army as infantrymen, pictured taking a brief rest from warfare to recuperate. One can be seen peeling an apple with a knife, with guns and equipment prevalent in the scene. Photographer Paul Castelnau captured the moment on June 16, 1917. It’s one of the highest-quality colored pictures captured during the war. The death toll attributed to WWI is devastating, estimated at around 20 million deaths (including civilians). A further 21 million people were wounded over the course of the four years. As France saw a lot of action, a vast number of military personnel were killed. Between 20th and 27th of August 1914 alone, the French lost 40,000 men. As the war continued the death toll rose, seeing pop up cemeteries litter hillsides. 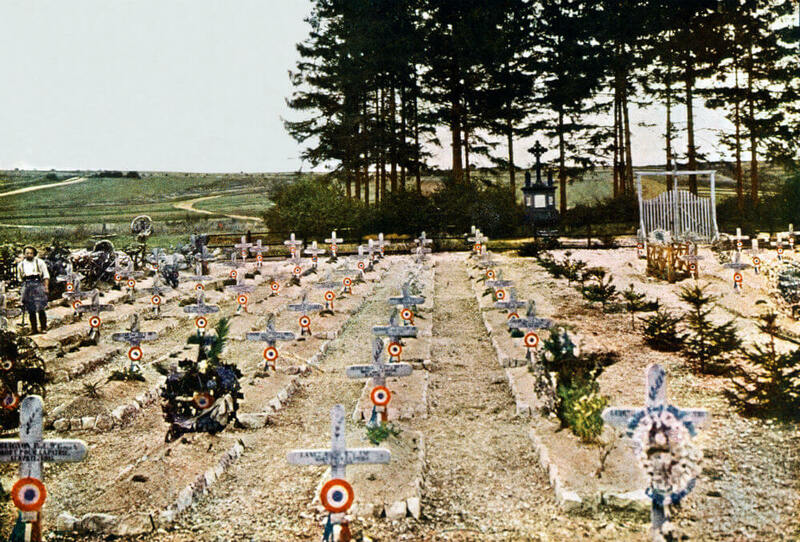 Jules Gervais-Courtellemont took the above picture of a French military graveyard in September of 1916. Each grave is marked with a makeshift cross. Soldiers were always required to look their best, with trimmed hair and shaved faces wherever possible – much like today. What’s more, taking pride in their appearance gave them a much-needed emotional boost. Of course, having a shave wasn’t number one on the list in wartime France, but it wasn’t last on the list either. 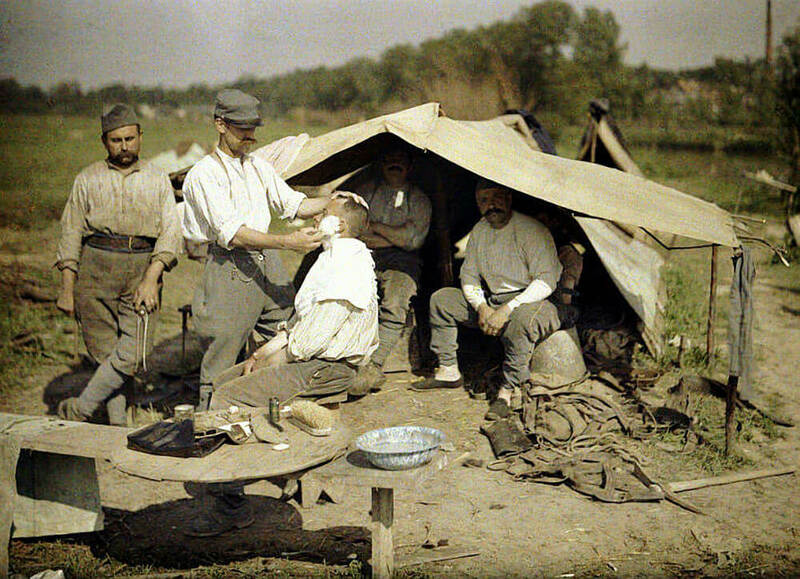 Fernand Cuville photographed this everyday scene of a barber attending to soldiers in a military encampment in 1917. One man is being freshly shaved while others wait for their turn underneath a canopy to shelter themselves from the unforgiving sun. France and England aren’t just close in proximity, they have remained allies for many years. 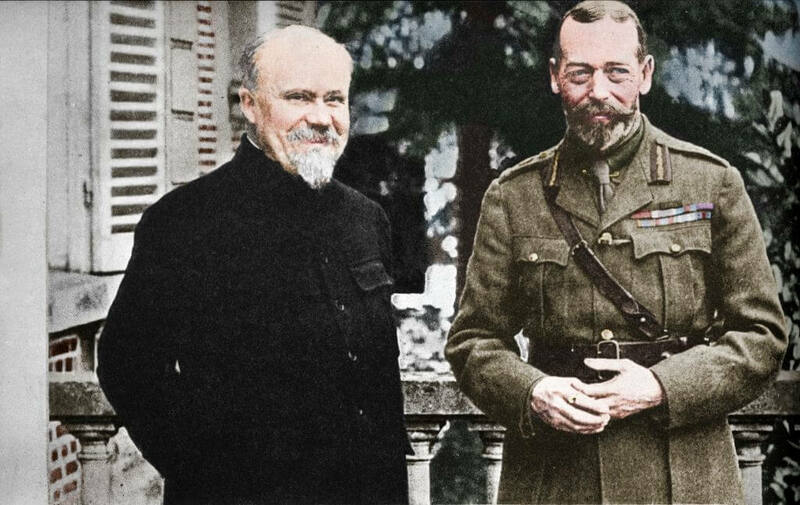 Here, King George V meets with the 10th President of France, Raymond Poincare, during WWI. The exact year is unknown, but it’s estimated at 1916. The two leaders met at the British General Headquarters in France, likely to discuss strategies and their shared hope for an end to the fighting and bloodshed. King George V had been seriously injured in 1915 when he was thrown from his horse at a troop review in France. This and his heavy smoking habit would contribute significantly to his death in 1936. When fighting in the Middle East, soldiers weren’t afforded the luxury of traditional ambulances. The terrain wasn’t usually passable by car, so instead, they used camels fitted with stretchers to take the wounded to safety. 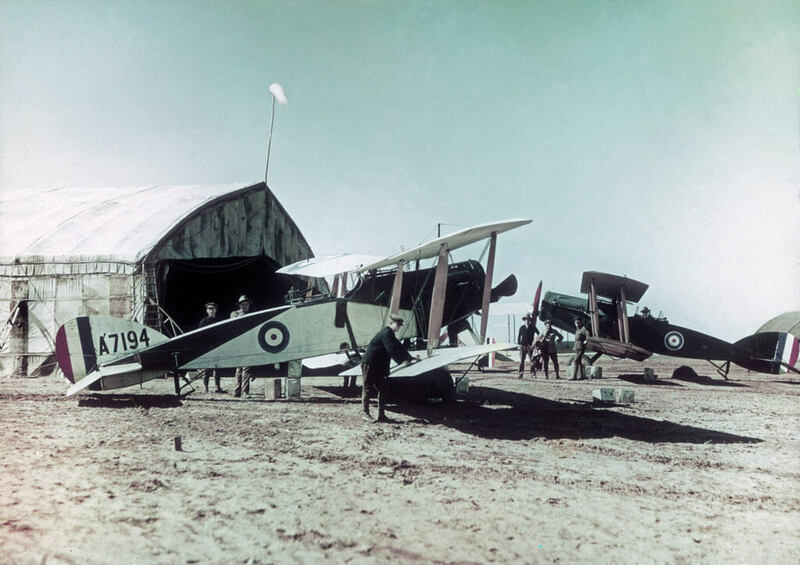 Four camel ambulances are pictured here at Rafa, on the base used for the attack on Gaza in 1918. 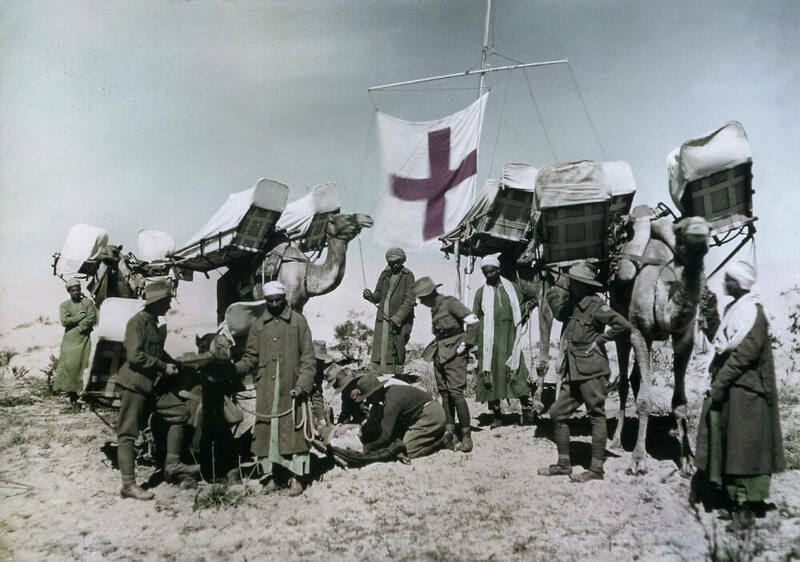 In the middle of the camels, there is a Red Cross banner to alert both parties that they were evacuating the wounded. The Red Cross has existed since the mid-1860s, created as a way to ensure medical workers were able to signify themselves as neutral during the conflict. Not only were millions killed in the conflict, but the world lost a lot of important historical heritage, too. Just as each country was starting to put back together their towns and cities, World War II would roll around, bringing with it a new wave of destruction. The Church of Saint-Gervais-et-Saint Protais was built between 1494 and 1657 on the site of two earlier churches in the 4th arrondissement of Paris. In March of 1918, a German shell fell on the church, killing 88 people and wounding 68 others when the roof collapsed during a Good Friday service. 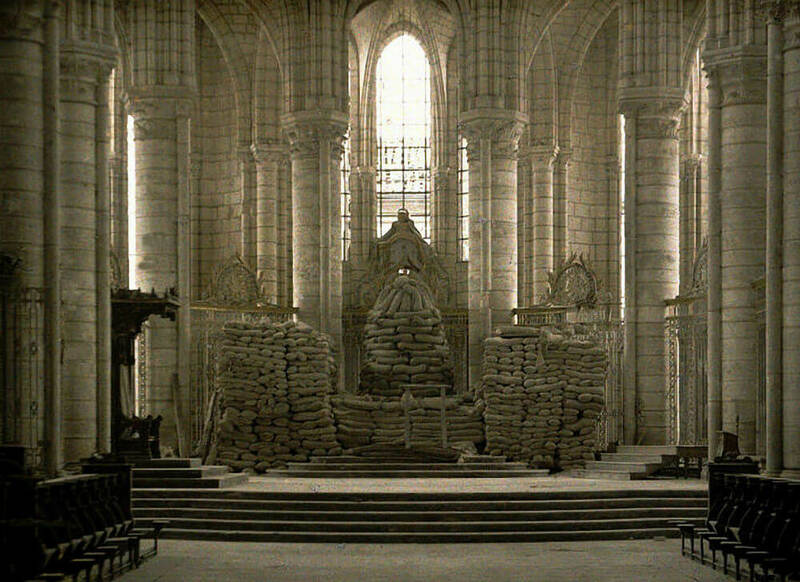 This photograph shows sandbags stacked up around the altar to try and protect it. During a war, every move has to be meticulously organized and highly orchestrated. Lines of troops fill out landscapes like planted tulips. No matter where you were fighting during WWI you had to be sure that you were primed and ready to move at a moment’s notice. This was particularly true in the Middle Eastern Theatre. 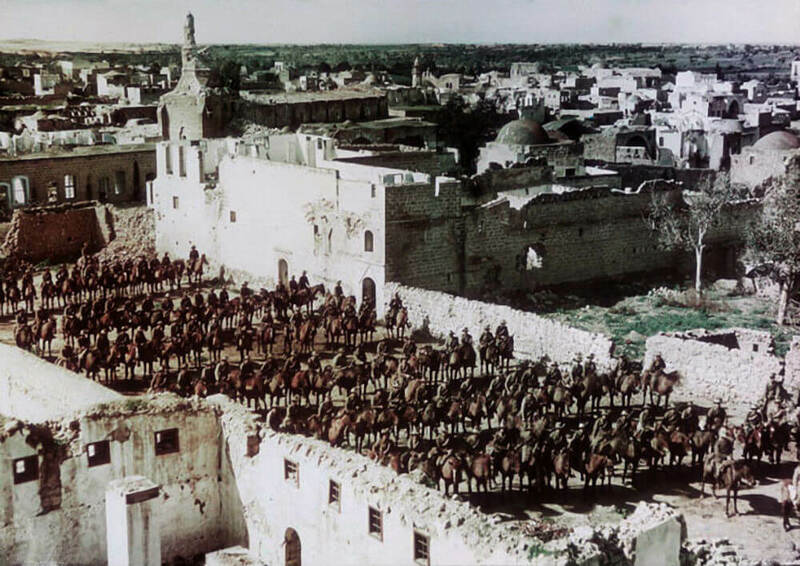 Photographed by Frank Hurley, the squadron of the 4th Australian Light Horse Brigade are in formation, standing on the ruins of a building in Palestine in 1918. The soldiers would’ve been weather-beaten and exhausted, but they plowed ahead regardless. What other choice did they have? 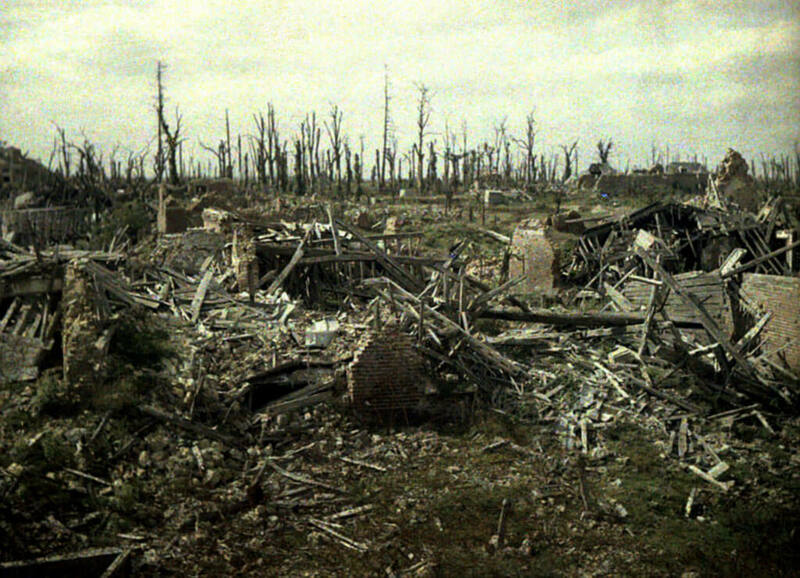 In a war of this scale, casualties were constant, especially in areas that saw the most action like the Western Front. Doctors, nurses, and other medical professionals worked tirelessly around the clock in conditions that would be unfathomable today. It was one thing getting the injured from the front line to the hospital, and another thing entirely to treat them. Here, the staff of field hospital 55 in Bourbourg, Nord-Pas-de-Calais take a moment to pose for a photograph on September 1st, 1917. Moments like this were few and far between, and perfectly encapsulate the resolve of the French military and medical staff. In areas of conflict, nothing was safe. Residents soon abandoned their homes, frantically trying to move their families out of harm’s way. Sometimes, what was left was a stark contrast to what had once been. 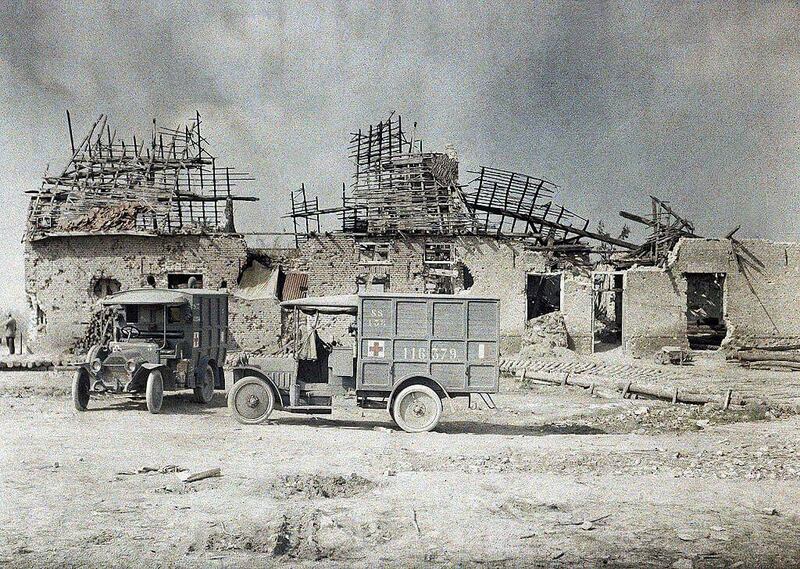 Two ambulances are photographed here by Paul Castelnau, as they wait outside of a building completely destroyed by artillery fire in Belgium, circa 1917. Many important things happened that year in relation to the conflict. US President Woodrow Wilson declared war on Germany, Jerusalem fell to Britain and Greece entered the war in support of the Allies. All of these events would prove important when it all came to an end the following year. Soldiers were expected to fight in the harshest conditions, with little in the way of nutrition. Not only were food supplies limited, but so were portions. French soldiers on the Western Front barely had enough to get by and often went hungry. Corned beef, bread, and biscuits made up the majority of their diet. 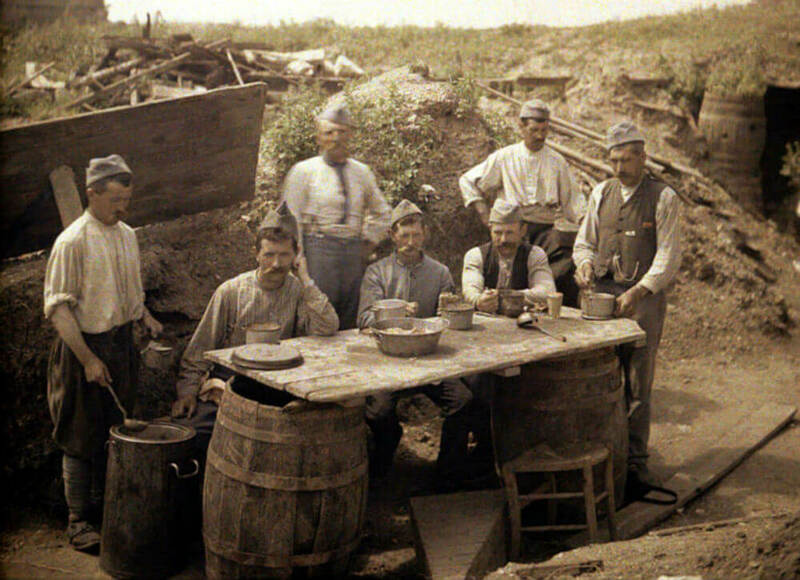 In this picture shot by Fernand Cuville in 1917, seven soldiers are gathered around a table for lunch. This time its soup, a welcome difference from the canned beef they’re used to. The makeshift table serves them well as they take a moment to gather their strength. The Gallipoli Campaign, also referred to as the Battle of Gallipoli or the Dardanelles Campaign, was waged in the Ottoman Empire. It took place in modern-day Turkey from February 17, 1915 to January 9, 1916. The campaign was an attempt by Britain and France to capture Constantinople (now Istanbul), the capital city of the Ottoman Empire. The campaign was not a success for Britain and France, and there were many casualties on both sides. It was the war’s only victory for the Ottoman Empire. This photo was taken for the Australian Historical Mission. We can see a landing barge, along with trenches. These are two aircraft from the No. 1 Squadron of the Australian Flying Corps. They’re both Bristol F.2B Fighters but are painted in two different color schemes. The closer aircraft is done in a half-white scheme while the one in the background is done in the Corps’ standard colors. 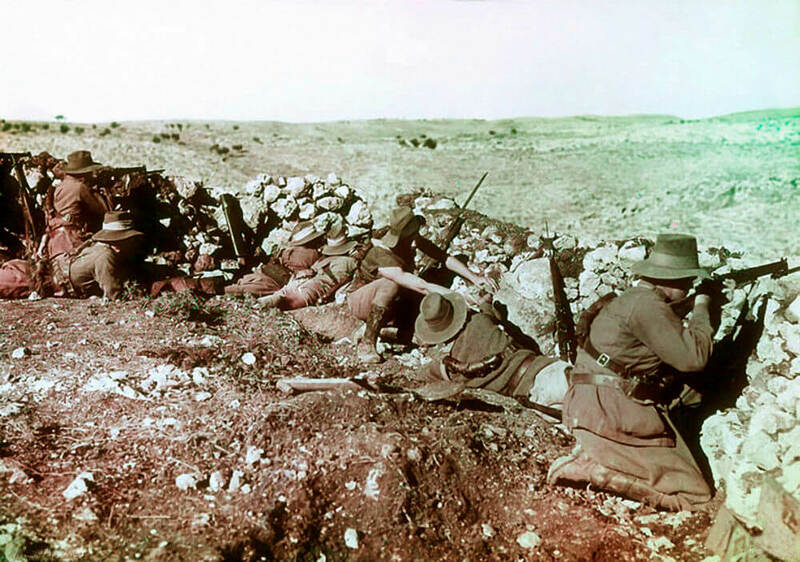 The Australians fought against the Ottoman Empire in the war. This photo was taken at a base in El Mejdel, a Palestinian Arab village on the Sea of Galilee base. It’s dated February 1918. Nothing speaks to the devastation of war so much as the sight of stretchers bearing the dead and wounded, soldiers and civilians alike. This photo shows members of the 13th Australian Field Ambulance as they take a much-needed break at a dressing station (first aid station). This scene took place in Belgium in October of 1917, in the Ypres sector of the Western Front. The area was Romans in the first century BC. During the Great War, it was the site of the Battles of Ypres, fought by German and Allied forces. This man is a gunner with the 1st Australian Siege Battery. His name is Harold Alexander Triggs. 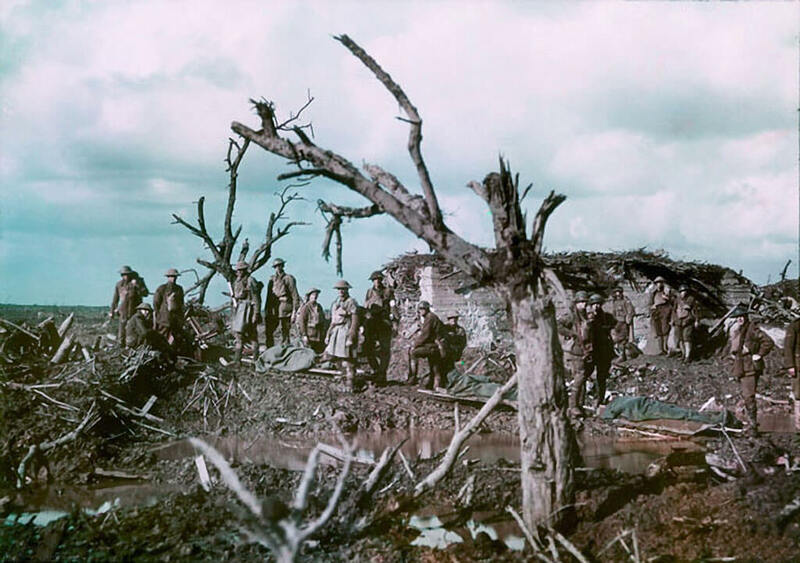 This scene took place at Birr Cross Roads in Ypres, Belgium on September 26, 1917. It was two days before they launched an attack on Polygon Wood. According to his enlistment papers (available online), Triggs was from Brisbane, Australia. He joined the Siege Artillery Brigade on June 30, 1915. 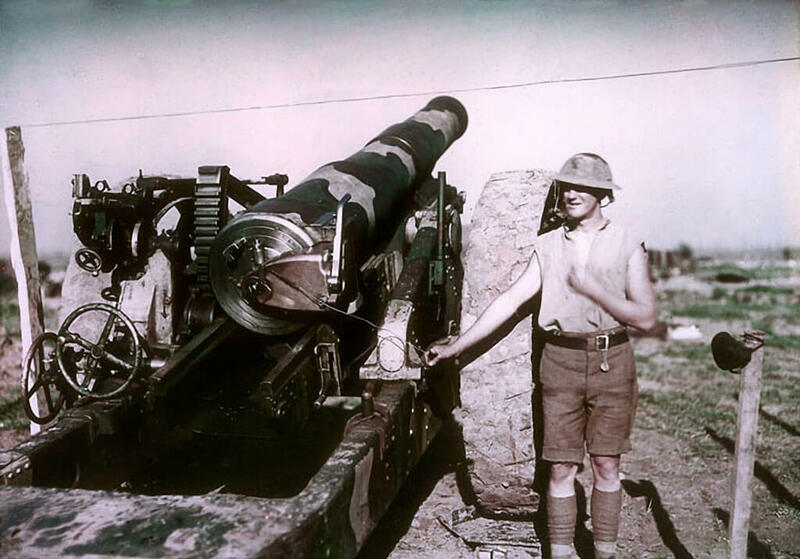 Gunner Harold Alexander Triggs is awaiting the order to fire a camouflaged eight inch gun from the 1st Australian Siege Battery at Birr Cross Roads two days before the main attack on Polygon Wood. Western Front, World War I. 26th September 1917. Ypres, Belgium. 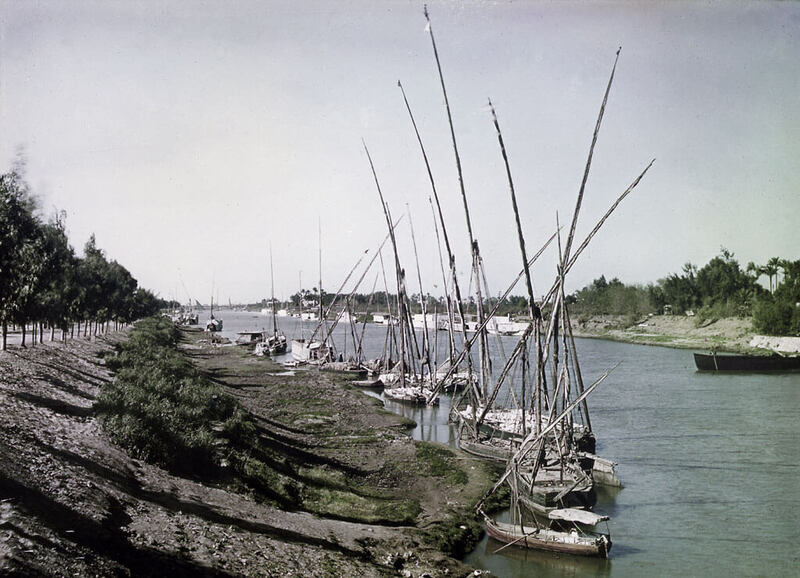 Felucca are traditional Egyptian boats. With an average capacity of ten people, today the boats are used for both tourism and for transport along the Nile. They can only be safely sailed in protected waters like the Red Sea and the Nile. Egyptian forces fought with the Allies in three continents during WWI. This color Paget plate photo comes to us courtesy of photographer James Francis Hurley. It was taken in 1918, most likely on the banks of the Nile River. The 1917 bombings of September 10 and 11 left massive damage behind. 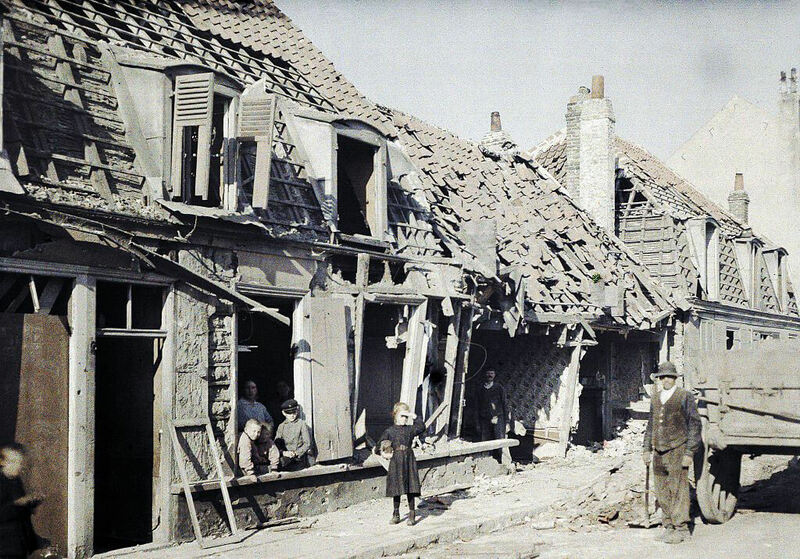 This photo shows what the bombs did to a couple of buildings located in a town called Rosendaël, which is near Dunkirk. We see adults and children huddled in rubble, staring back at the camera as if in a daze. A small girl appears to hold a doll or some other toy as she shields her face against the sun in order to see the camera, while a man stands off to the side carrying a stick or firearm. Images like this illustrate the bleak tragedy of war. The two men seen in this photo are French soldiers. They are standing near a narrow gauge railroad track near the village of Boezinge in West Flanders (Belgium) on September 10, 1917. The region has just been heavily damaged by enemy fire. 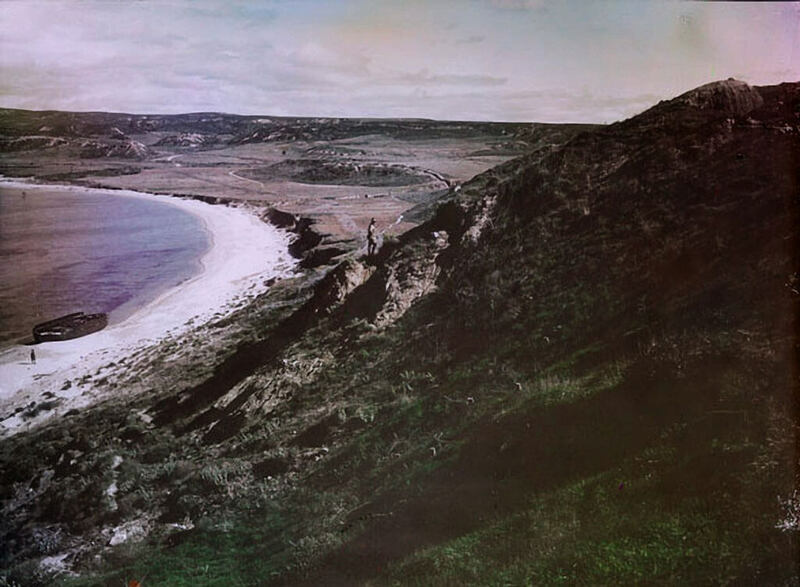 This photo was taken by Pierre-Joseph-Paul Castelnau, who was a French geographer in addition to being a photographer. He served in the Geographic Service of the Army and documented much of the devastation caused by warfare. It might be difficult to imagine keeping up with the news during war, especially before the age of internet journalism and smart phones. 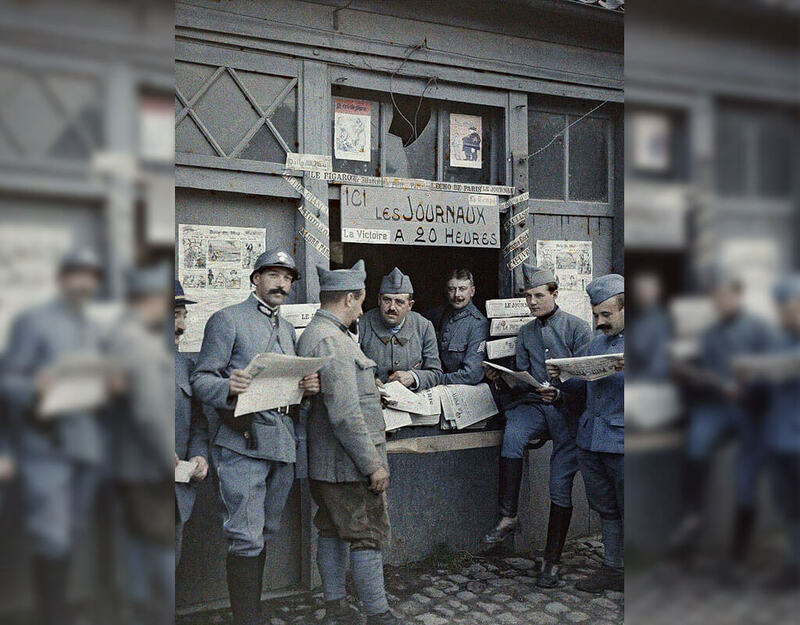 These soldiers are trying their best to stay abreast of developments as they read the paper at a newsstand in Rexpoede, a town located in the Nord section of northern France. The shop’s sign reads “Newspapers” and says “20 heures,” indicating that it’s open 20 hours a day. A list of available titles surrounds the store’s open window. A broken window above that indicates that the area has most likely seen some of the fighting. 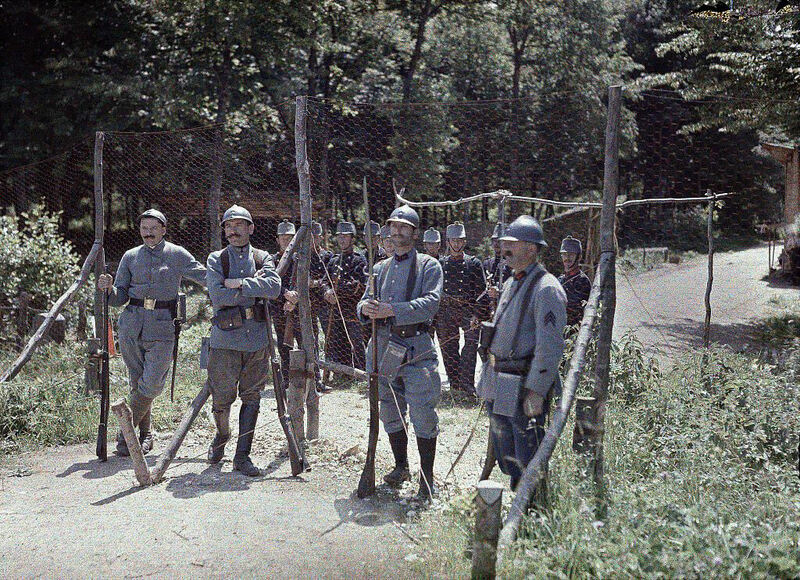 These soldiers, all French border guards, are standing in front of a fence near the town of Pfetterhouse. This fence delineates the border between Switzerland and France. Behind the French soldiers we can see a group of Swiss guards. Throughout World War I, Switzerland remained armed but neutral. The country kept this stance during World War II and it also served as a safe haven for refugees. It became the home of many “politicians, artists, pacifists, and thinkers,” per the Historical Dictionary of Switzerland. The French army had a core of Senegalese soldiers who fought alongside them, called The Senegalese Tirailleurs. The word “Tirailleur“ means “rifleman” or “sharpshooter.” The Senegalese provided around 200,000 troops to WWI efforts. About 30,000 of them were killed. The infantrymen pictured here are Bambara, a Mandé people living in West Africa. The photo was taken in Balschwiller, France, on June 22 of 1917. The photographer was Paul Castelnau. 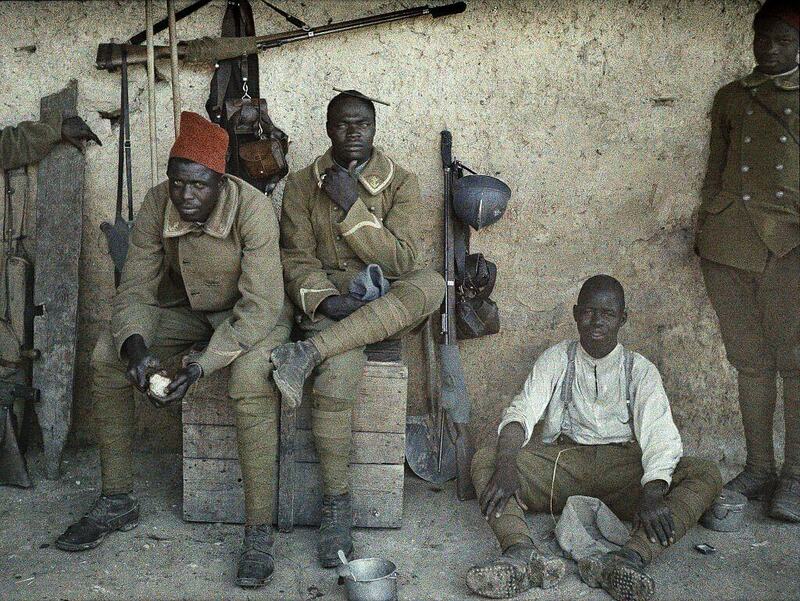 Here are four more members of the French Army’s Senegalese Tirailleurs. They’re seen here taking a break in a storage room, which is full of guns and other necessary equipment. Three of the soldiers look into the camera while the fourth stares off into the distance. One man is having a snack, and another even seems to be smiling a bit despite the horrors of war they’ve all likely seen. This Autochrome Lumière was taken by Paul Castelnau on June 16, 1917. It’s from Saint-Ulrich, Department Haut-Rhin, of France’s Alsace Region. 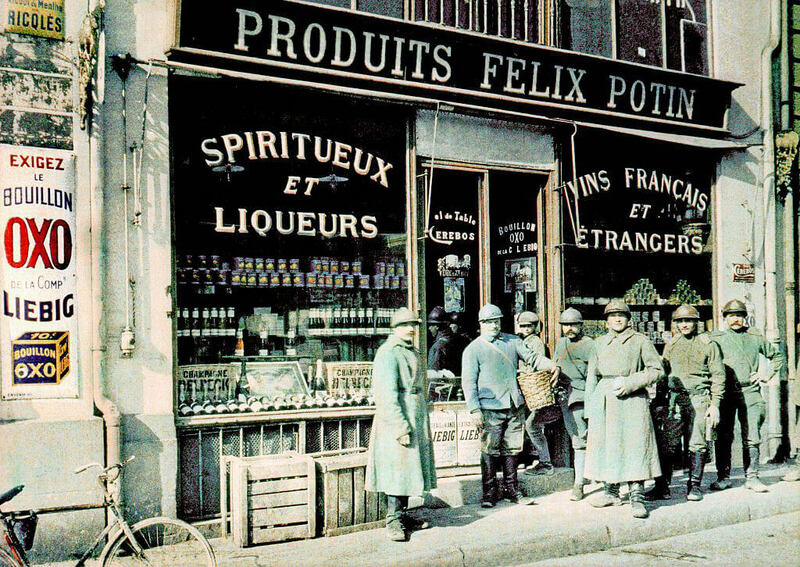 These are French soldiers standing in front of a grocery store in Market Square in Reims, France. The shop has a variety of canned and bottled goods displayed in the front windows. Signs also advertise that liquor is available for purchase. Reims was one of the hardest-hit cities in the war. There were hardly any buildings standing by the end of WWI, with the Germans targeting cultural landmarks like cathedrals and libraries. Around 5,000 of the city’s civilians were killed in the war. 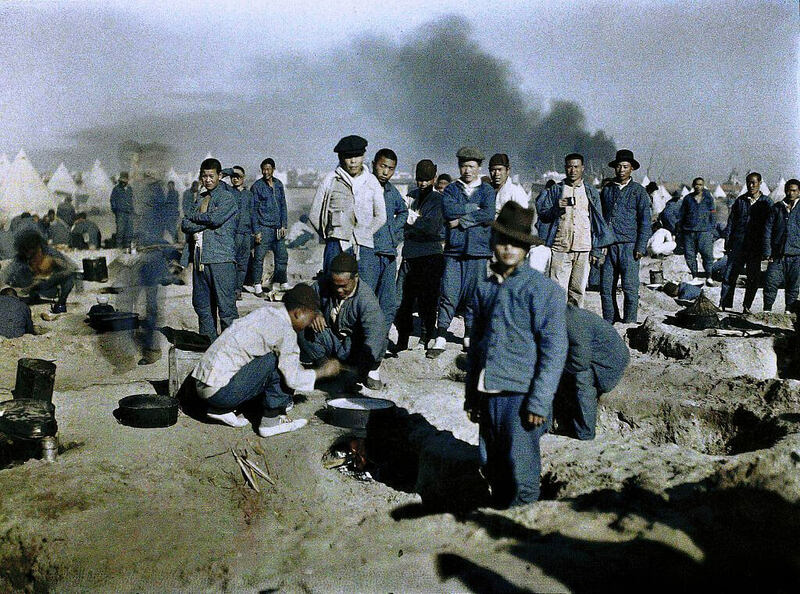 This 1917 Autochrome Lumière image by Paul Castelnau depicts a group of workers with the British Chinese Labour Corps. They were brought to work in the Middle East campaign. The effort in that part of the world started with the defense of the Suez Canal and allied reconquest of the Sinai peninsula in 1916. The Labour Corps did physical tasks like digging trenches and repairing roads, which freed up soldiers to fight on the front lines. Roughly 140,000 men served in the Labour Corps during WWI. Many of them were sent home to China following the war. These are soldiers who were wounded on the battlefield near Laffaux, France. Each of the soldiers looks wearily into Fernand Cuville’s camera lens. They’re being tended to at Saint-Paul Hospital, which we saw another image of earlier. This photo was taken in 1917. A total of 21 million people were wounded worldwide during the first World War, slightly more than the number who were killed. Needless to say, hospitals and medical centers were in high demand at this time. 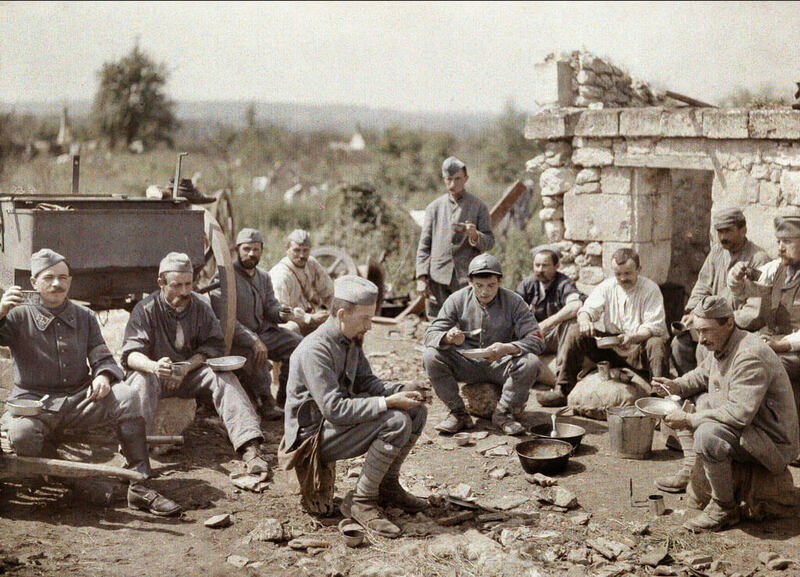 Here we see French soldiers of the 370th Infantry Regiment taking a quick break for a rest and a lunch of soup. 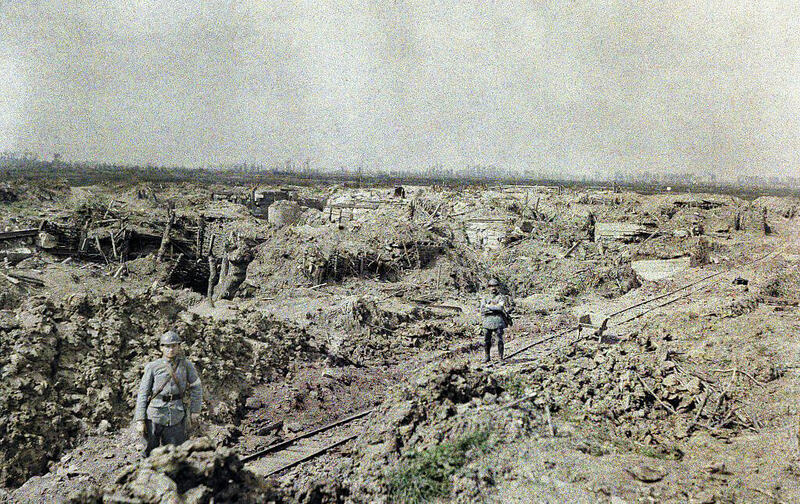 This photo was shot by Fernand Cuville during the battle of the Aisne. Traveling kitchens would accompany troops. They were assembled near battle sites and prepared meals for the soldiers. 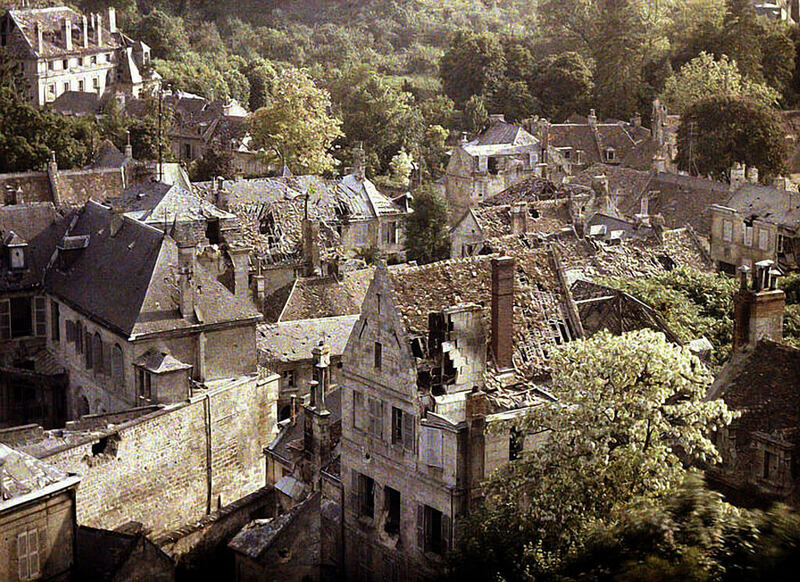 This scene shows a group of formerly-majestic looking homes, surrounded by lush trees, that are now in ruins thanks to the war. The photo was taken in Soissons, France. German troops took over the city twice during the war and caused extensive damage to its buildings with artillery fire. Fernand Cuville took this photo in 1917. The following year there was a five-day-long Battle of Soissons which led to even more destruction as well as the deaths of 107,000 Allied troops. Desperate times call for innovative thinking. 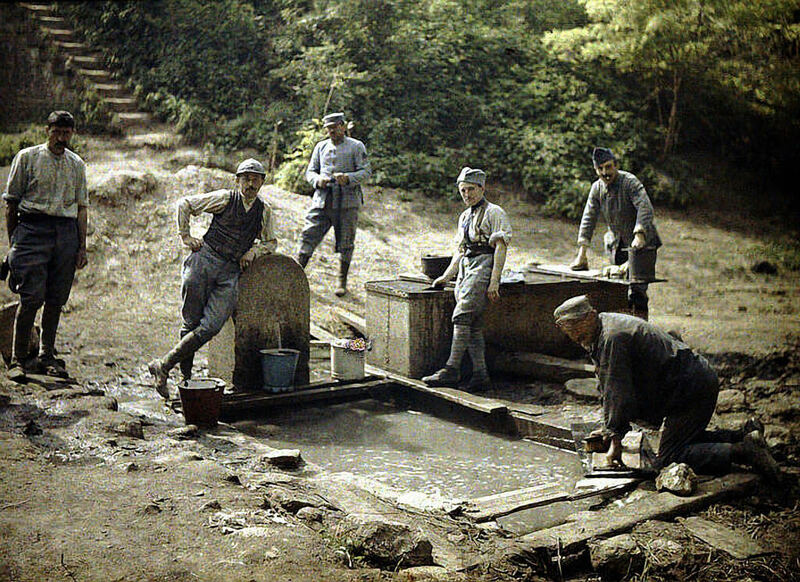 These are six French soldiers who are washing their clothes in a fountain. This Autochrome Lumière photo by Fernand Cuville was taken in 1917. The site is Soissons, France. The ability to wash clothing (even in a fountain) was a luxury that many soldiers out in the field probably did not have. Troops had to make do with what they had access to, and these men doing their laundry are a prime example of that. What you see here is the former town of Chaulnes, northern France. The town was devastated during multiple events and battles during the war. It was located in the “red zone,” 12,000,000 square acres of land in France where post-war reconstruction was made especially difficult because of the devastation. The presence of thousands of human and animal corpses, as well as millions of unexploded bombs, made reconstruction so dangerous. However, Chaulnes was eventually rebuilt but some areas of the Red Zone still have not been reconstructed. This photo was taken in 1917. The Croix-Rouge is the French Red Cross. 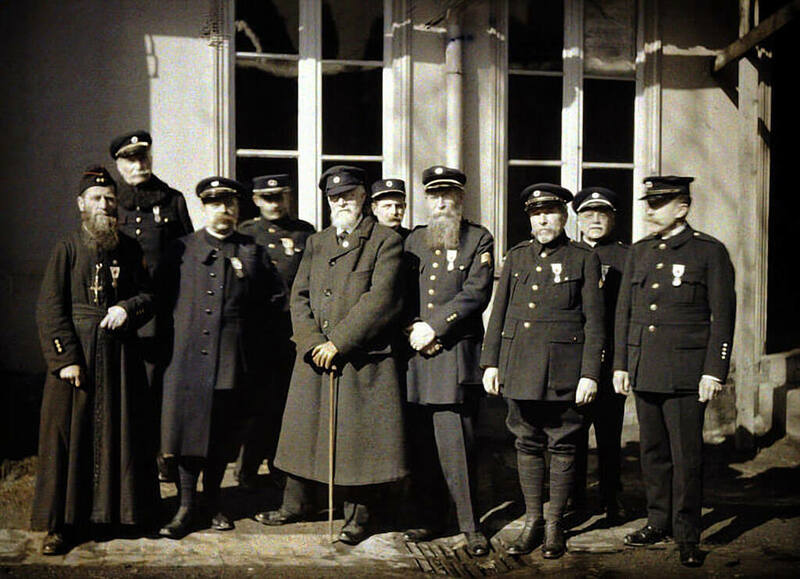 Here are ten members of the group posing somberly for Fernand Cuville in 1917. This was in Marne, France. The Croix-Rouge was established in 1864, initially called the Société Française de Secours aux Blessés Militaires. It has been diligently serving the community since then, with emergency response and international aid. Today, the association has 18,000 employees and 56,000 volunteers working hard to improve lives worldwide. 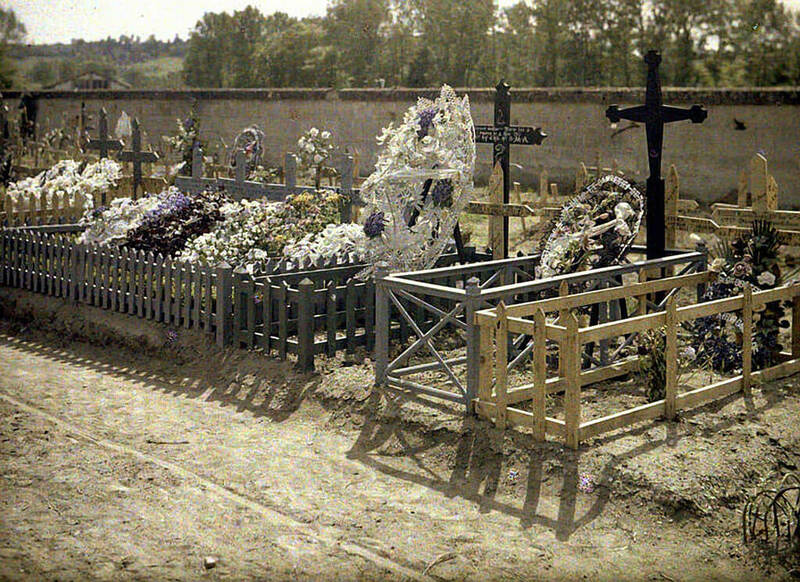 These are the fresh graves of French soldiers who were killed in Laffaux in May of 1917. This was during the Second Battle of the Aisne. A total of 117,000 French soldiers were killed in the battle — 32,000 of those in the first days alone. Approximately 163,000 German troops were killed and some 37,000 went missing. 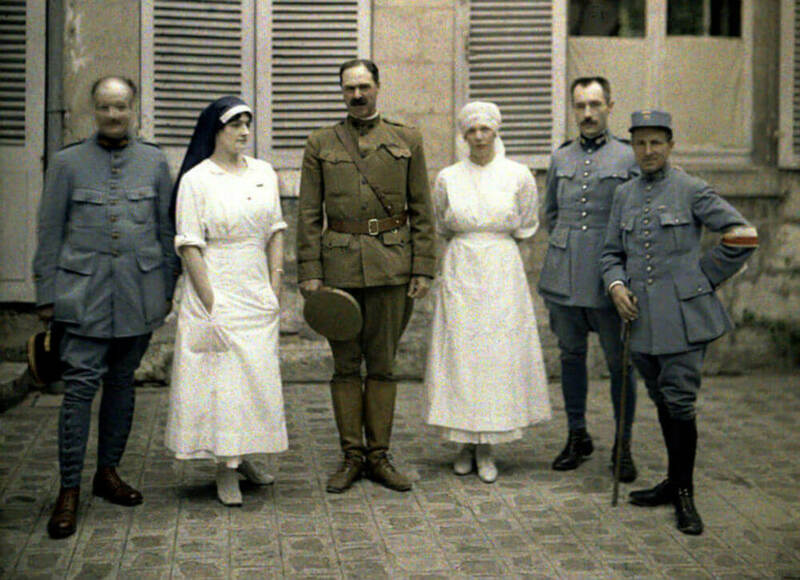 Fernand Cuville took this Autochrome Lumière photo the same year as that deadly battle, 1917.